ZP 9B rotary tablet press is a miniaturized tablet press, which is mainly used in small-scale tablet production and technology research in pharmaceutical, chemical, foodstuff, electronics and other industrial sectors. 1. 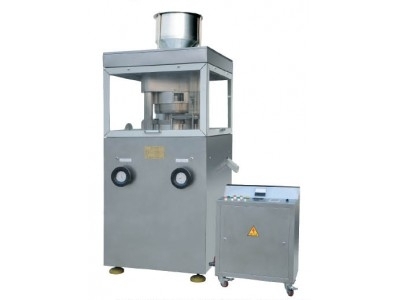 ZPS 9B Rotary Tablet Press is a small tablet press for small scale production and technical study in pharmaceutical, chemical, foodstuff and electronics industries. ZPS 9B Rotary Tablet Press serves as an important equipment to make sure whether the raw materials can be pressed into tablets. 2. ZPS 9B Rotary Tablet Press conforms with GMP's requirements. 3. ZPS 9B Tablet Press applies to the pressing of raw materials with less than 10% powder content. 4. ZPS 9B Tablet Press is suitable for pressing tablets ( 5-20mm ) in rounded and irregular shapes with characters. 5. ZPS 9B Rotary Tablet Press is not suitable for pressing semisolid, wet particles, hygroscopic & low-melting-point materials and powders. Pharmaceutical tablet press is a kind of pharmaceutical machinery used in pharmacutical industry. Pharmaceutical tablet press conforms with GMP standards. Pharmaceutical tablet press is suitable for producing round and irregular shapes of pills and tablets. 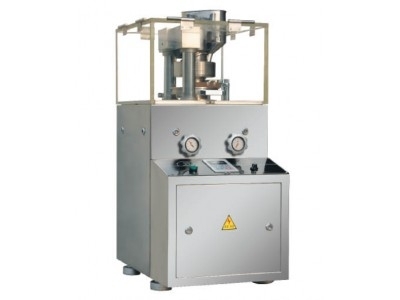 Pharmaceutical tablet press is easy to operate and maintain.